o change the quantities in your cart click "View Shopping Cart". Click "Check Out" to pay. Contains 36 unopened baseball card packs. 17 cards per pack - over 600 cards in all ! Other great players were made this year as well. These are from an original case. Note: These boxes were made before the baseball card companies began plastic wrapping their boxes. These sports card boxes are right from an original sealed unopened case. PS Each pack also contains a stick of gum. We do not recommend eating the gum, as it is over 20 years old! 36 unopened packs per box/ with 15 cards per pack. Cards are randomly packed. Possible ROOKIES and first regular cards of: Greg Maddux, Rafail Palmerio, Barry Larkin, David Cone, Kevin Brown, Barry Bonds, and other players including Mark McGwire, Cal Ripken, Jr., Jose Canseco, Nolan Ryan....etc. Over 500 cards in all. 1987 Donruss cards have always been harder to find than Topps from the same year. Note: Donruss did not plastic wrap their boxes back then. These are right out of an original case. 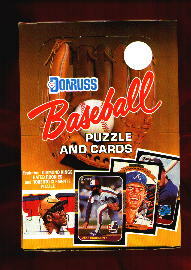 Donruss packs include a puzzle piece instead of gum. 15 cards per pack - over 500 cards per box. Cards are randomly packed at the factory - open the packs and you might possibly find a Gary Sheffield or Randy Johnson ROOKIE card. Or you might find one of the many other star players who played back then. Note: Topps did not plastic wrap their boxes back then. Do not chew the gum, as it was made over 15 years ago! of 36 unopened baseball card packs. Each pack contains 16 randomly packed baseball player cards. 576 cards in all......! What a great season it was 14 years ago. Open a pack and you might find ROOKIES such as Sammy Sosa, Bernie Williams, Larry Walker, Juan Gonzalez, Frank Thomas, Mo Vaughn, or lots of other rookie cards. And maybe some of the big sports stars of the day such as Mark McGwire, Ken Griffey Jr, etc. As with all boxes of cards back then, they were randomly packed by the manufacture so there's no guarantee of what players, or how many of each you may find. Box is right out of a factory case. Add this old box to your collection while it is still bargain priced. I know you'll be pleased with the condition of this box.....! Note: Player's photo on top of box may vary. Score did not wrap their packs in a Wax paper wrapping as Topps did this year. Instead each card pack was wrapped in a colored/clearish plastic wrapping that is tamper resistant. A trivia card instead of gum was included in each pack. Score did not plastic wrap their boxes back then.